Our clients can avail from us a broad range of pens, which is fabricated by our vendors employing high grade raw material. These are highly appreciated by our customers based across the market for their supreme quality, reliability and attractive designs. An exceptional collection of Thick Ball Pens can be availed from us at market leading prices. These are manufactured using superior grade raw material and tested properly at different stages by our analysts. Our ball pens are easy to hold and give a good grip. Therefore, these will not slip out of the hands even when writing very fast. We are offering good quality Ballpoint Pens in attractive colour and packing. 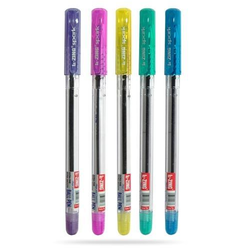 Features: SwissRide cartridge with an innovative ink system which provides extreme writing comfort.